Red is a great color to use as an accent for a Fat Chef themed kitchen. And a microwave is a wonderful accent! How many of us have our microwaves sitting on a counter or side table in our kitchen? So this becomes a perfect accent item to spice up a Fat Chef kitchen. When I’m planning what colors work well to accent my kitchen, I think about the look of the little Fat Chef guy. Yes, mostly he’s done up in black and white, but you usually want an accent color or two so that you have focal points and create additional flair in your decor. Red and yellow are great accent colors to go with your black and white Fat Chef decor. Besides the fact that each of these colors is usually found within the look of the little guy, both colors also bring attention. They go nicely to accent special items or draw attention to those items. See how this kitchen look incorporates a red microwave to show accent the fat chef look. Really spices up the kitchen doesn’t it? 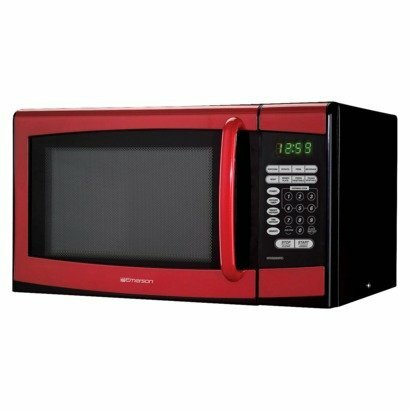 Here are some red microwaves that make great additions to your Fat Chef kitchen decor. Neither one will break your budget and they are both 900 watts so you get plenty of power for those quick cooking items you use a microwave for. For any small kitchen appliances that you choose to use, make sure you pick ones that work for your own cooking needs. There are some things to keep in mind. Picking small kitchen appliances that will help you will make a difference. So don’t be afraid to add red appliances in your Fat Chef kitchen to help accent your decor. Just make sure they will also accent your own cooking needs. What a lovely idea! Kitchen appliances can certainly become part of or add to the decor of a Fat Chef kitchen! Awesome idea! I love the idea of having a splash of color in the kitchen! 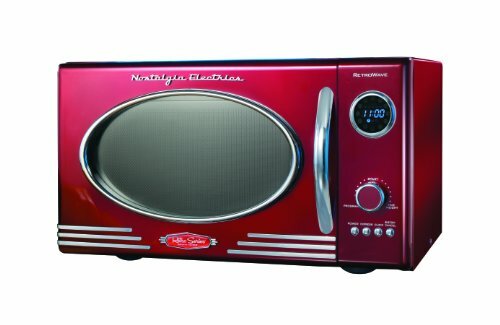 A red microwave would be a great way to add just the right accent to the room.